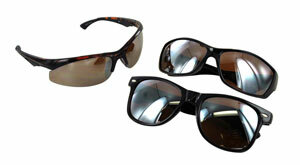 Today's Optical uses special amber-colored lenses for the American Rider sunglass line. The amber-colored lenses help in reducing glare and sharpeneing your view while on the go. $13.99 retail sunglasses are always popular.